Mindful Mothers: September PWAP - This Thursday! 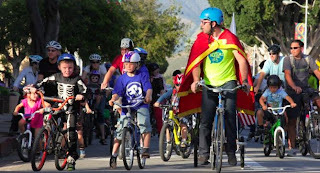 Bring your kids and bicycles and ride with us! We’re partnering with the SLO County Bicycle Coalition to promote the last summer “Kidical Mass.” Families gather at the Mitchell Park Gazebo between 530-6pm. Ride leaves the park at 6pm and proceeds on city streets to The Mission. The focus is to get kids familiar with road rules and to expose them to safe riding, but in a group setting. Kids can ride their own bikes/trikes or ride along on your bike’s child seat. Theme is UNICORNS, and costumes are encouraged. The Bike Coalition operates a free Bike Valet on Morro Street every Thursday, so you can leave your bikes after the short ride and enjoy Farmer’s and downtown! The Coalition is an advocacy group for bicycling in our county. They operate the Bike Kitchen were you can learn how to repair your bike or buy a used bicycle. They conduct bike education assemblies at schools. And they ROCK at pushing for more bike lanes and dedicated bike paths countywide. See http://connectslocounty.org/.